Regarding the article "Six Sigma and Terrorism" ( InsideSixSigma, Praveen Gupta, view online at www.qualitydigest.com/sixsigma): Analyzing a circumstance in which you can resolve a problem with a terrorist demonstrates a lack of reality. A terrorist is like a lion who sees you as something worth eating. Lion tamers and similar folks have done so at the expense of their life or limb. Only a foolish person would consider otherwise, and that is why we common-sense folks don't take such thoughts seriously. The article "Six Sigma and Terrorism" was brilliant. By associating the tools we use for day-to-day business and applying them to human behavior, the author was able to shed some much-needed light and sense on an otherwise senseless subject. Terrorism has been around since the beginning of time. Utilizing Six Sigma to show how proven techniques can cause a positive outcome to any problem was very profound. I can only hope that our government and others around the world recognize this. This article is an example of a common problem: applying a solution that works in a limited context to all problems. It's ridiculous to believe that Six Sigma, an approach for improving business processes, has much (if anything) to offer in the arena of political or religious conflicts. While all civilized liberal democracies desperately want terrorism to end, they won't achieve peace using Six Sigma. Proposing such pie-in-the-sky applications damages the credibility of Six Sigma proponents. Regarding "Top Ten Stupid Six Sigma Tricks" ( InsideSixSigma , Steven Ouellette, view online at www.qualitydigest.com/sixsigma ): Mr. Ouellette, unfortunately, you are not wrong. The problem with fads, as opposed to lifestyles, is that you can look and sound very cool at the big dance, but if you really don't understand what you're talking about and you're only doing it to satisfy a certain somebody who's trying to look and sound cool, too, but doesn't really get it either, it's all a waste. Isn't it? I have been a quality manager for the past 13 years, and customer surveys indicate absolutely nothing ("Don't Survey Your Customers," Craig Cochran, September 2006). I send them as part of our system requirement to customers I know will give us an excellent review. The best way to show customer satisfaction is through daily contact, notes and, of course, customer PPM and customer reports. This article was the best I've ever read about the negatives of most customer surveys. Companies have dedicated departments and oodles of people focused on an activity that reaps no return benefit because it's a flawed approach! The author even provides a value-added method of how customer feedback can be achieved in an efficient manner. The "Predicting Quality Outcomes Through Data Mining" article (Tony Grichnik, Thomas Hill, Ph.D., and Mike Seskin, September 2006) had a very valuable suggestion to use existing data for prediction of process/product improvement. What they did not mention is the value of collecting as-is data, namely the conditions present while collecting the data. I took a problem-solving and decision-making workshop by [consulting and training firm] Kepner-Tregoe, and it became obvious that advance planning in your data collection can add value to future analysis of failure modes. "Be Your Own Health Care Advocate" (Dr. William L. Roper, September 2006) was an interesting article. I certainly think that health care is one of the areas where the quality industry has the opportunity to have a major influence in terms of how quality and the voice of the customer are addressed. I think it is an "emerging market" that is ripe for applying quality principles. I would comment that I think quality as defined by the consumer has to include not only "How likely am I to be healthy when I leave the hospital?" and "How quickly will that happen?" but also, "What will it cost me?" Especially in the area of health care, where costs have continued to rise, this has to be considered. I enjoyed the "First Word" column (Dirk Dusharme) and the "Home-Grown Quality" article (Laura Smith) in the September issue. I would like to inform readers that "sharing quality" has been and still is in action in the local chapters of the American Society for Quality. I have been a member of ASQ since 1977 and have belonged to several different local chapters. All ASQ local chapters gear monthly meetings, workshops, roundtables, etc., on sharing and learning from practical applications of the quality sciences. We share what works, what doesn't and why. 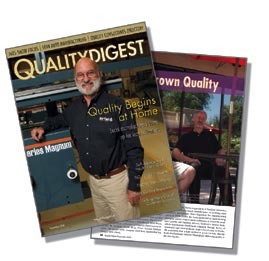 Don't just read a great magazine like Quality Digest ; try attending a local ASQ chapter event!